"Full of benefits and super easy to add to your dog's food." "Supports healthy skin, a soft coat, and a strong immune system." "The liquid form will be easier for dog owners who struggle with a pill." "Customers have seen a noticeable reduction in skin irritation." "Includes ingredients like flaxseed and palm fruit oil for additional nutrients." "Formulated to reduce shedding clear up issues like flea-bite dermatitis." "Another benefit of fish oil is its ability to reduce to loosen up stiff joints." "Rely on a blend of fish oils and milk thistle to support kidney health." 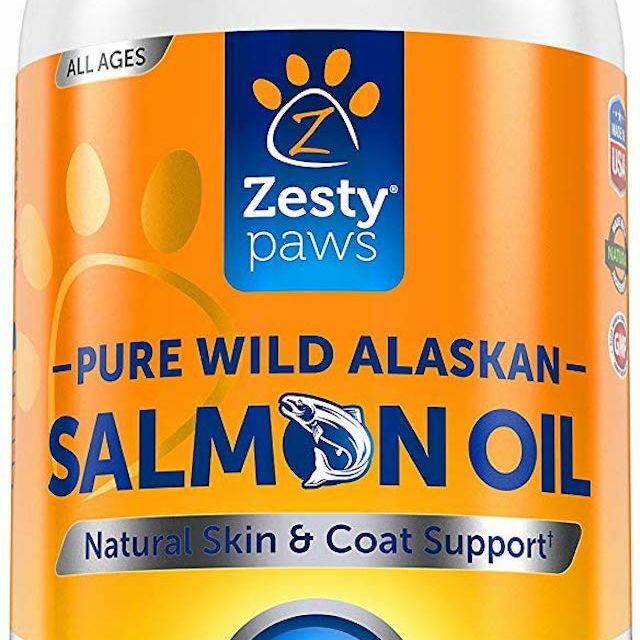 Our top pick for dog-friendly fish oils is this one from Zesty Paws. Sourced from Alaska salmon, it features both Omega-3 and Omega-6 fatty acids and is rich in EPA and DHA, the compounds that are full of benefits ranging from a softer coat to increased heart and brain health. Sold in a pump bottle, simply add a bit to your dog’s food during mealtimes for an easy alternative to a capsule or chew delivery. All told, it’s packed with nutrients aiding hip and joint function, immune health, and more. And since it relies on salmon oil rather than a blend, it’s suitable for dogs with sensitivities to other types of fish. While customers say their dogs love the extra flavor in their food, their owners are even happier about the changes they’ve noticed in their pets. Several mentioned that their arthritic dogs appear to be more active and spry, while pets with skin allergies and hair loss have shown dramatic improvements since starting on Zesty Paws. If you prefer to give your dog a supplement rather than mix fish oil with his or her meal (some dogs dislike the flavor), there are plenty of pill options with the same benefits. Nordic Naturals Omega 3 Pet Soft Gels has all the health benefits of fish oil in an easy-to-swallow pill. Containing anchovy and sardine oil, it’s full of EPA and DHA to support healthy skin, a soft coat, and a strong immune system (among many other things). The oils are also formulated for optimal absorption, ensuring they reach your pup's system quickly, and they are the same quality you’d find in a human-grade product. Customers write that soft gels like Nordic Naturals are ideal for smaller dogs, noting that their larger cousins may require multiple pills (thus making them less cost-effective). They’re still highly effective, particularly for dogs who struggle with allergies or arthritis, and less messy than a standard pump bottle. For many pet owners, a liquid supplement is still the easiest way to get fish oil into your dog’s diet. Vital Pet Life Salmon Oil is made using only wild-caught Alaskan salmon and is full of EPA and DHA omega 3 fatty acids. Like other fish oil products, it works to strengthen cell membranes in the skin, making them less prone to itching, while also working to reduce inflammation. The product is non-GMO and certified sustainable, and the liquid form will be easier for dog owners who struggle with giving their pets a pill. Customers write that their dogs’ coats have a noticeable gleam after taking Vital Pet Life Salmon Oil with their meals—and it also works wonders for skin irritation. The pump system makes it easy to determine the correct dose for your dog’s meal, although some customers recommend using a plastic syringe to reduce accidental spillage. Need to stock up on feeding supplies for your pup? Check out the best dog bowls on the market. Supplements containing only a single source of fish oil are preferable for dogs prone to allergies, for similar reasons that you’d feed them a limited ingredient diet. Grizzly Salmon Oil contains only pure Alaskan salmon oil but has over 15 omega 3, omega 6 and arachidonic fatty acids. Sold in a four, eight, or 16-ounce pump bottle, it’s a great way to give your dog the nutrients they need to ward off skin allergies—while the use of a single source of fish oil ensures it won’t cause any adverse reactions itself. By introducing Grizzly Salmon Oil during mealtimes, customers have seen a noticeable reduction in skin irritation or flakes in their dogs’ coats. The fatty acids effectively calm an overactive autoimmune system, resulting in a happier, less itchy dog (and that’s not even mentioning the added benefits for vision, cognition and organ health). If you've struggled to find the right food for your dog due to allergies, read through our guide to the best dog food for allergies. This supplement from pawlife is formulated specifically for skin, coat, and allergy support. While its first ingredient is salmon, it also includes ingredients like flaxseed and palm fruit oil for additional nutrients that add shine to your dog’s coat. Still, the standout ingredients are the omega 3, 6, and 9 fatty acids derived from fish oil, providing powerful support for your dog’s skin and coat. Sold as soft chews, these supplements have a rich salmon flavor that dogs love. They go down like a treat rather than a pill. Customers write that since introducing pawlife Omega 3 for Dogs, their pets’ coats have never been softer. Say goodbye to itchy, dry skin or wiry fur—just offer the supplements by hand or drop them into your pet’s meal for a flavorful, highly beneficial treat. And for more chews with nutritional benefits, check out our list of the best dog chews. Does your furry companion suffer from skin issues? Lipiderm Fish Oil from International Veterinary Sciences uses a blend of omega 3 and 6 fatty acids to clear up dry, patchy, or scaly skin. Containing fish oil, castor oil, and flaxseed oil, it’s formulated to reduce shedding, control scratching, and clear up issues like flea-bite dermatitis. The fatty acids in the product (sold as soft gels) help to fight skin inflammation, and the presence of vitamins A and E support a healthy immune system. According to customers, dogs with severe scratching problems have shown improvements within a week of taking Lipiderm Fish Oil. While some dogs dislike the taste, it generally helps to mix it in with their regular meals (or just dunk it in some peanut butter). If your dog struggles with skin issues, this supplement will go a long way toward making them more comfortable. One of the other benefits of fish oil is its ability to reduce inflammation and loosen up stiff, achy joints. Finest for Pets Omegease Omega-Rich Fish Oil uses a blend of oils derived from wild sardines, anchovies, herring and mackerel for a potent combination of EPA and DHA fatty acids. In addition to supporting the joints, it’s great for the immune system, heart, and brain, and comes with all the expected benefits for the skin and coat. The liquid formulation mixes easily with food and is free of the fishy smell that’s noticeable in some supplements. Finest for Pets Omegease Omega-Rich Fish Oil is a great way to support joint health in older dogs, customers write, pairing it with other supplements like glucosamine. The instructions on the bottle make it easy to determine how many pumps you should give your dog during meals—a helpful detail for owners of larger dogs who may be more prone to hip and joint issues. Another way to help your pooch rebuild their cartilage and strengthen their joints is by giving them a glucosamine supplement. Some studies suggest that fish oil may also be beneficial for dogs with kidney disease, with a focus on the ability of omega-3 fatty acids to remove certain proteins and improve kidney function. These supplements from Vita Pet Life rely on a blend of fish oils and milk thistle, a flowering herb, to support kidney health and prevent stones. It contains EPA and DHA for renal support (as well as brain, heart and liver health), and comes in a bite-sized tablet that goes down easy. Vita Pet Life’s Milk Thistle supplements also include potassium and folic acid, and customers praise the quality of the ingredients. They’ve noticed a difference in their dogs with kidney and liver issues, noting that their blood work has shown improvements since starting on the supplement. Interested in reading more reviews? Take a look at our selection of the best probiotics for dogs. Our writers spent 5 hours researching the most popular fish oils for dogs on the market. Before making their final recommendations, they considered 15 different fish oils overall, screened options from 10 different brands and manufacturers, and read over 75 user reviews (both positive and negative). All of this research adds up to recommendations you can trust.